Crew aboard VIGILANT drop a jib topsail as the skies darken at the start of the third race of the America’s Cup defense, Friday the 13th of October, 1893. Though ahead throughout, challenger VALKYRIE II would find bad luck on the stormy run home, losing her enormous spinnaker, handing a close victory to VIGILANT. In the 1893 America’s Cup Vigilant faced Valkyrie II in a best three out of five races format sailed on alternating courses. 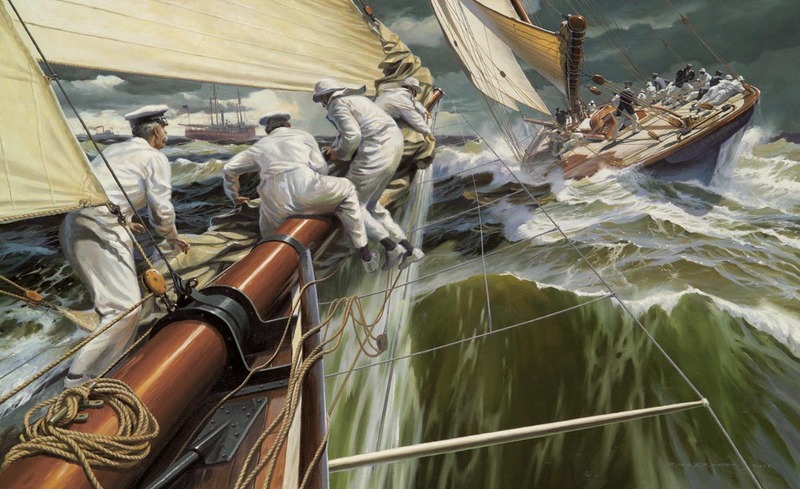 The races were sailed October 7, 9, and 13, 1893 just south of New York. The first and third races were 15 miles to windward off Scotland Lightship and return to leeward, the second race was a 30 mile equilateral triangle. Lord Dunraven’s daughter became the first female to sail in an international yacht race in the United States. In the first race on October 7, in light air, Valkyrie II won the 11:25 am start by 15 seconds and one boat length. At the first mark, Vigilant held a nine minute lead. Vigilant crossed the finish line 7 minutes ahead ofValkyrie II—8 minutes 48 seconds in corrected time. In the second race on October 9, Vigilant won the 11:25 am start by 5 seconds, but Valkyrie II worked out to an early lead of 5 boat lengths in a building 24 miles per hour (39 km/h; 21 kn) breeze. By the first mark, Vigilant held a five minute lead and worked out to a 9 minute lead at the second mark. At the finish Vigilant beat Valkyrie II by 12 minutes 30 seconds—10 minutes 35 seconds in corrected time.